Jessica Chastain is nothing if not an expert actor, deft in portrayals of some of the most complex female characters we’ve seen on the big screen of late. If you don’t believe me, catch her in Miss Sloane or Molly’s Game and you’ll see what I mean; her portrayals of strong, glamourous women are as flawless as the hair and make-up of her characters. But the level of dedication she’s bringing to her new role – a long way from the city lights of her previous roles – is enough to make her eyes bleed. Literally. 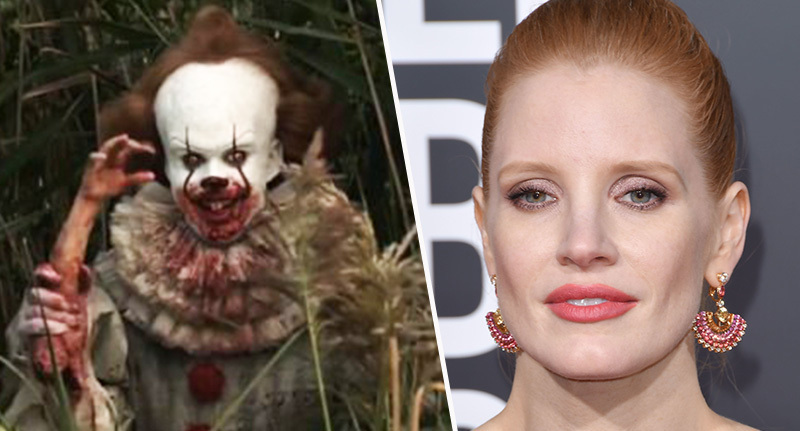 Chastain will be playing an adult Bev in IT Chapter 2, a sequel set 27 years after the original narrative which sees a bunch of kids terrorised by the clown killer Pennywise. The 41-year-old actor will be joined by the cast members from the first movie – including Stranger Things‘ 16-year-old wonder boy Finn Wolfhard – but the adult timeline will be the focus in this second story about the death of childhood innocence. The kids will only show up in flashbacks, as the adult characters try to get to grips with the terror they faced from the self-titled eater of worlds. While the plot of the film is shrouded in mystery, Chastain let on with a little spoiler to whet your appetite last night on The Tonight Show Starring Jimmy Fallon. In the movie, there’s a scene… Someone said on set it’s the most blood that’s ever been in a horror film in a scene. And I’ll tell you, the next day I was like pulling blood out of my eyeballs. She quickly reiterated, in case you don’t know the difference between reality and fiction, the blood was indeed fake. While the claim the scene depicts the most blood in film history is yet to be confirmed, it’s up against some tough competition. Think of the moment the lift doors open in The Shining or the blood sprinklers in Blade or the deaths of the Crazy 88 at the hands of The Bride in Kill Bill. What about Carrie, for Pete’s sake?! We always knew the sequel to the 2017 adaptation of Stephen Kings’ IT was on the must-watch list… But it just got bumped up a few notches to becoming potentially one of the most brilliant horrors of 2019. Grab a pillow to hide behind. It’s gonna get bloody.